Should I have a plan in place to prepare for a health emergency? The questions that accompany aging may seem daunting. That’s why the City Bar Justice Center’s Planning and Estates Law Project (PELP) has compiled a guide to answer your most pressing concerns. 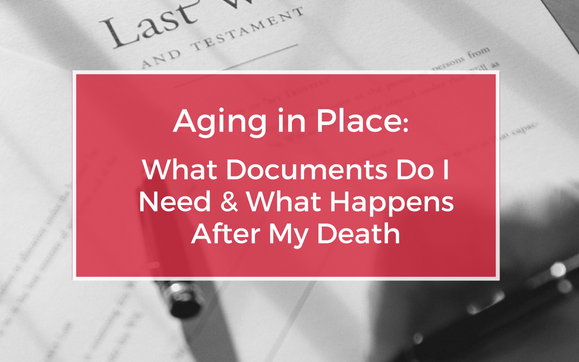 In “Aging in Place: What Documents Do I Need & What Happens After My Death,” two of PELP’s experienced volunteer attorneys answer questions from readers like yourself about end-of-life care, planning, wills and probate, and more. The guide also provides two printable questionnaires for you to document your important information, in case of emergency. First questionnaire: contains your important personal information. It should be kept in a private and secure location, for a trusted loved one to access in case of your incapacity or death. Second questionnaire: contains emergency contact information and should be kept in a clear location, like on top of your refrigerator. It’s important to have this information easily accessible to police or emergency medical technicians (EMTs) in case of emergency. We created these documents with you in mind! Please print them out and use them for your own emergency preparedness. This presentation was originally made to Bloomingdale Aging in Place on May 30, 2018, by PELP Chair Pamela Ehrenkranz and Vice-Chair Glenn Opell.